Usually, art collectors are not artists, who, fortunately, have an inherent and valuable ability to make educated visual judgments. However, some of the greatest artists of our time, such as Picasso and Warhol, were extraordinarily diligent collectors who never re-sold a single object. “Art Collecting” is not a subject in which one can major while at college, although to become a great and successful collector, you could use the equivalent of a college degree in developing an “eye” and perhaps a “nose,” along with a sense of value. It may take longer to master these skills than it would to earn a Ph.D. It is true that some collectors have an influential foundation from adventuresome parents, who were themselves very interested in art and often led by example, or occasionally offered cash for a birthday with the proviso that the money be used to acquire something wonderful with a frame around it. A collector may have been inspired by a few art history electives or have a particular attraction to their local museum, but eventually, collectors fall in love with their subject and become serious as they experience the surprising joy of acquiring and living with original works of art. Perhaps the final initiation is discovering that some of your decisions were met with envious compliments, requests for loans to museums, and dramatic increases in original values. 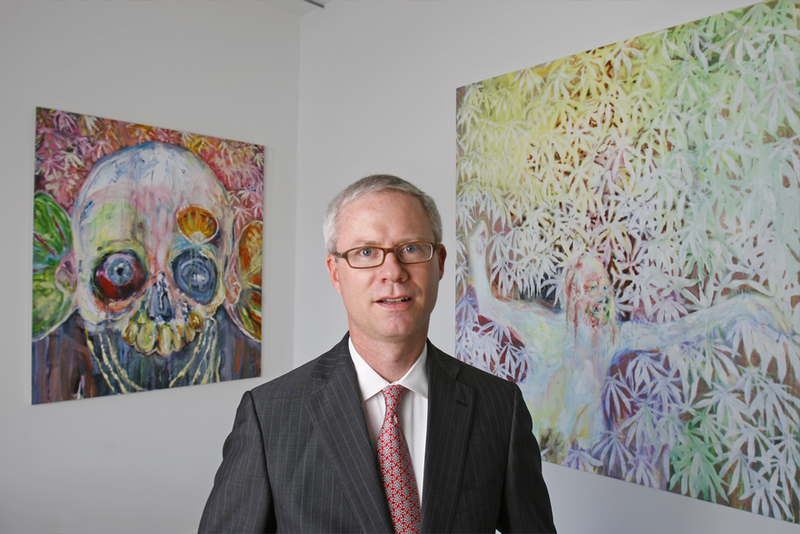 Palm Beach-based collector, John Morrissey, was a law student at Georgetown University when he developed his interest in art while working at the university’s library; he filled his breaks by reading through the art magazines. Without a single art appreciation course, Morrissey is a self-taught collector and burgeoning connoisseur who has waded into the arbitrary, high-risk world of art investing and is enjoying a measure of success that would make any art enthusiast jealous. His impressive collection fills his home, office, and like most art buffs, storage spaces as well. He estimates that he owns around 250 works of art with about 35 (or 14%) of them hanging in his home and office. Less than 5 years after occupying his break time with art magazines, one of the art world’s leading publications, ARTnews, named him one of the top young collectors of contemporary art. There were a few other touchstones that sparked Morrissey’s collecting. After law school, he returned home to West Palm Beach at about the same time Jason Rubell opened his eponymous gallery on Palm Beach’s world-famous Worth Avenue. Frequent visits to the gallery and discussions with Jason, before the gallery was absorbed by the Rubell Family Collection and relocated to Miami, provided further tutelage—a kind of on-the-job-training. An exhibition that at once reinforced and expanded Morrissey’s collecting direction was the 2007 gallery show at Zwirner & Wirth entitled, Old School. 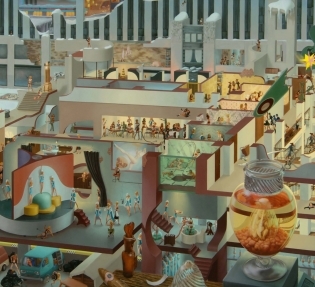 The exhibition paired such Old Masters as Jan Brueghel the Elder and Lucas Cranach with established and emerging painters, including John Currin, Elizabeth Peyton and Hilary Harkness. Morrissey already owned many of the younger artists in the exhibition, like Harkness and Karen Kilimnik, but was introduced to emerging English painter, Anj Smith, who is now in his collection. He collects with a passion and a mission—a passion that leans mostly toward paintings and photographs with a figural, representative bent. When he began acquiring art in the early 1990s, the work followed the “pathetic aesthetic” of the time that renounced the superficiality and vices of the 1980s. There was and continues to be another strategy—target the talented, young American (with a few exceptions) painter, and when possible, those that are female or multi-cultural. Why? If public institutions of all sizes are veering away from the centuries-old white male dominated acquisition game plan, then why not do the same? Eventually some of these artists will become the Hoppers, O’Keeffes, Pollocks and Warhols that define this moment in the history of art. Morrissey also asserts that the eye of the art market is coming back to the US after years (somewhat) turned away to the Young British Artists of the 1990s, then Japan with Takashi Murakami, the New Leipzig painters and the historical phenomenon of artists in China. Therefore, he pursues and purchases, when possible, in depth, the superb emerging artists living and working in the United States. So far, his intuition and educated discipline have paid off handsomely. Profits from any works sold go back into a fund for purchasing more new art works at the entry level of pricing. Yes, art collecting is an investment that can yield high returns, but is also one that requires solid research—a difficult task to accomplish by this self-described “working man.” Morrissey’s day job as a sole-practitioner lawyer does not leave much time to travel on the international art fair and gallery opening circuit. (His rare attendance at art fairs might also have to do with his opinion that while art fairs offer great opportunities to see and speak with other collectors and curators, it is also the “mall-ification” of the art market and where most artwork is exceedingly overpriced.) Following his professional practice, he collects alone without the advice or supervision of a consultant or curator. He finds the hunt too enjoyable. It is the conversations with gallerists and private dealers (for which he has a core, go-to group of both), artists and collectors, reading the print and virtual pages of art publications and websites and watching videos at theartnewspaper.com and vernissage.tv that inform his astute acquisitions. There is also the analysis of what art schools (both undergraduate and graduate programs) the most established and best-selling Contemporary artists have attended; statistically these schools are (in no particular order) Yale, Rhode Island School of Design, Pratt, Cal Arts and the School of the Art Institute of Chicago. In 1999 and 2006, large samplings of Morrissey’s collection were exhibited in his hometown at the Museum of Contemporary Art—At Century’s End: The John P. Morrissey Collection—and at the Armory Art Center—Palm Beach Collects: The John Morrissey Collection. With each show, a publication was produced that included numerous color images (and postcards) and substantial essays by Morrissey. In the introduction to the Armory show catalogue, he describes both the show and its catalogue as his “humble attempt to expose young artists who I consider the originators of defining trends in the art market.” Both essays are filled with astute surveys of the works and vivid commentary on the surrounding social history. In other words, Morrissey writes like he collects—with purpose and a comprehensive master plan, as opposed to vanity and see-and-be-seen, name-dropping fluff stories. Morrissey’s early purchases in the 4 to low 5-figure range of work by Cecily Brown, Jack Pierson, Kehinde Wiley and Loretta Lux can now reach the high 6-figure mark. (In a 2007 Bloomberg Business Week article he is quoted as saying, “My artists have outperformed any other investments I’ve made.”) Combine this with loan requests from the National Portrait Gallery and MoMA PS1, and seeing photographs that you collect also on the walls of Geffen Contemporary, and you know that with your self-training and analyzing of the art market, you have achieved the brilliant “eye” for collecting and have become proficient in effectively calculating the risks associated with purchasing Contemporary art through studied scholarship, familiarity, enthusiasm and sharpened vision. MARISA J. PASCUCCI IS A NOTED AUTHOR, SPEAKER AND EDUCATOR WHO HOLDS A MASTER’S DEGREE IN MUSEUM STUDIES FROM CASE WESTERN RESERVE. SHE IS THE FORMER CURATOR OF AMERICAN ART AT THE NORTON MUSEUM OF ART, CURATOR OF THE EVERSON MUSEUM OF ART, SYRACUSE, AND ASSOCIATE CURATOR OF COLLECTIONS AND EXHIBITIONS AT THE MONTGOMERY MUSEUM OF FINE ARTS. Article Source: Pascucci, Marisa. "John Morrissey." The Art Economist, January 2011, pp. 58 - 63. 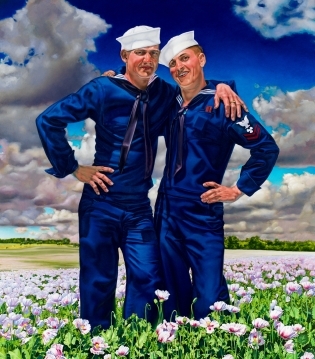 Ain Cocke, Poppies, 2009, oil on Canvas, 82 x 74 in. (208.3 x 187.9 cm), Courtesy of the artist, � Ain Cocke. Hilary Harkness, Mother Lode, 2005-2006, oil on linen panel, 30 x 33 in. (76.2 cm by 83.8 cm), Courtesy of Mary Boone Gallery, New York. Top: Loretta Lux, The Wanderer, 2003, ilfochrome print, © 2010 Artists Rights Society (ARS), New York / VG Bild-Kunst, Bonn, © Loretta Lux, Courtesy of the Artist and Yossi Milo Gallery, New York. 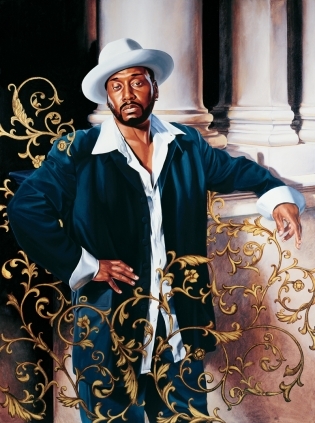 Kehinde Wiley, Passing Posing-Big Daddy Kane, 2005, oil on canvas and enamel, 8 x 6 ft. (2.4 x 1.8 m), Courtesy of Roberts & Tilton, Culver City, CA.